Unlike the meeting when the second application was discussed, when each member of the committee spoke in turn to give their own personal perspective on the planning application, this one gave the public the impression that either the members had agreed beforehand what the outcome was going to be and were largely going through the motions, or that they were bored with seeing the same arguments on a planning matter that they had seen before, and just wanted to see the back of it. Patricia Webb spoke for the Junction Road and Environs group. She covered all that it was important to say and said it well, but there was no visible reaction from the committee members. David Hadfield spoke in favour of the development, and in spite of all the emphasis place on the three-minute time limit, nobody interrupted him when the time expired and he carried on well beyond his time. He said what you would expect him to say: that he had amended the design to meet the objections to the previous version; and that every body on the council he had spoken to liked it, so it should be approved. Ian Gilchrist spoke for Widcombe Ward, largely giving statistics on how many had contacted him against and how many for (with the majority against). Shaun McGall spoke for Oldfield Ward, again with statistics, but also pointing out why the flats were unacceptable. Neither got any visible reaction from the committee members. Brook Whelan had intended to speak against the flats, but the time of the meeting (2pm) made it impossible for him to attend, and his request to reschedule that agenda item to a later time so that he could be there was refused. The designated planning officer was not there, and the officer's brief was given by somebody whose name was not given. That brief was superficial and misleading, pointing out inconsequentials like the solar panels being hidden from sight by the shape of the pitched roof, and his concern about whether a satellite dish was appropriate, yet positively misleading the councillors by identifying the step down the hill as a vertical distance between one roof and that of the neighbouring building, completely missing the point that is is the line of the slope that is important, and that when the distance between buildings varies then the vertical distance should vary to maintain an even slope. So he made the flats look smaller than they will be once built. He also failed to mention every single instance where objection comments had shown that the flats did not comply with Local Plan policies. As far as a landscaping plan was concerned, he was sure that the council's landscape officers could agree something suitable, and did not expect that to be designed to hide the building in any way. It was a travesty of a brief. Of the 12 people sitting in judgement, only six spoke at all. Brian Webber and Steve Wilcox both thought that the developer had done enough to make the application acceptable this time, and proposed and seconded that the application be approved. Whilst the level of public objection might have suggested otherwise, you have to respect that they made their judgement, and were prepared to explain it to those listening. Colin Darracott listed pros and cons and concluded it was a difficult decision. Gerry Curran worried about the bulk, about the dormers looking wrong, and about the loss of privacy for those that would be overlooked by the flats. Paul Crossley thought 14 flats was an over-development of the site. Eleanor Jackson expressed her general disquiet about the design, about the lack of a landscape scheme and concluded in the end that if the building had been designed with one fewer stories, she could have supported it, but not as currently before her. The vote showed 8 for approval, 3 against and 1 abstaining. So it was approved. The public has no right to appeal against an approval. In approving it, the Development Control Committee has ruled that the flats will cause no harm whatever to the conservation area. Six people sitting round that table and voting to approve it did not bother to explain how they reached that conclusion. Cowards! A planning application trying to amend some of the building details. The plans omitted rubbish handling facilities, supplementary heating plant, a proper assessment of the weight or horticultural construction of the planted dormers. The architect chanced his arm, and now he has actually got to build something, all the corners he cut to get it approved will come back to haunt him. Lorries using the Junction Road entrance to the site. The conditions attached to the approval limit the use of that gate to emergency and maintenance vehicles, which means that any construction vehicles trying to use that entrance are not permitted. If you see any such vehicles, take down the registration number and report them to the council enforcement officers. The architect had been in touch with the Residents Group to protest about the images on their website, accusing them of being wrong about the height of the building and therefore misleading those who read it. He has repeated these accusations in correspondence with the Planning office and copied it to the local councillors. Unfortunately, he did not actually read the description of the pictures he objected to, which were a wish list of the changes that the residents would like to see. His accusation was therefore way off target. Equally unfortunate is his insistence that his flats are not as tall as the school building next door, when a combination of an Ordnance Survey map and his own drawings show that his flats building will be taller than the school building, when viewed from the road in front of each. The contour lines on the map are at 5 metre intervals. The 45 metre line crosses Upper Oldfield Park in front of the school building, and the 40 metre line crosses the road just in front of Oakford House. When measuring from the road level, there is thus a 5 metre difference cause by the slope of the hill. 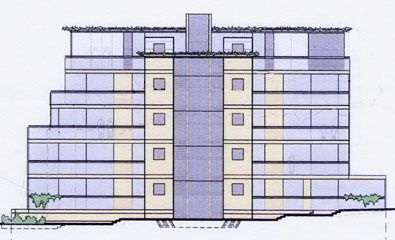 By contrast, the planning drawings use an arbitrary horizontal datum line. 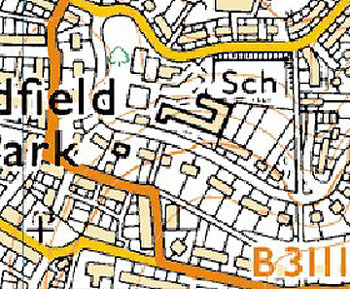 The Hayesfield School ridge is shown at 60.49 (drawing 492:5:M:002). 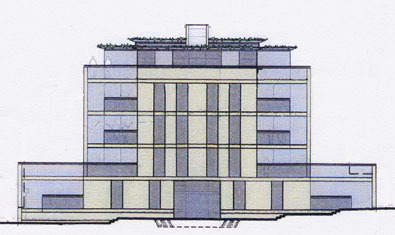 The roof ridge of the flats is shown at 58.93 (drawing 492:5:M:003). But there is a 5 metre difference in the road surface (and therefore in the eye position of the viewer), so adding this to the downhill location gives 58.93 + 5 = 63.93. So the flats are 63.93 - 60.49 = 3.44 metres taller than the school building when viewed from the road in front of each building. The architect's own figures plus definitive Ordnance Survey height measurements prove that, despite the architects protests to the contrary. The residents group has now been promised that as a minimum, Brooke Wheelan will speak on behalf of the Widcome residents, and Shaun McGall will speak on behalf of the Oldfield Park residents. Will Sandry still does not know if he will be able to attend. The residents are very grateful that once again they are being supported in their efforts to block inappropriate designs for a building in this location, in the hope that eventually something that fits comfortably in the Conservation Area might eventually be proposed. The Residents Group website had some pointers to what is wrong with the design and how it can be changed to make it more acceptable. A third attempt to secure planning permission for a building to replace Oakford House has been submitted. This one is taller than the second attempt (and very nearly as tall as the first attempt, which the planning committee insisted was too tall for the location), but it does now have some styling features of the other buildings in the street, although it is not close enough to what is required in the Conservation Area to be acceptable as presented. The Junction Road & Environs Residents Group wanted to start from a stance that this third attempt is nearer what is acceptable than the previous ones, but that some significant changes would need to be negotiated with the architect to improve its appearance. However, all attempts to start negotiating have come to nothing, and all requests for further information have been met with a stark refusal by the Planning Officer: I have looked at the application and am of the view that the information provided is sufficient for the Local Planning Authority to consider the proposal and at this stage there is no requirement for further information to be provided was the response to the request for further information. Take a look at the apology for a Design and Access statement that has been provided, and wonder how such a conclusion might have been reached! A complaint has been lodged with the council over that attitude. The Residents Group now want a massive show of objections rather than allow this scheme to be approved through lack of public interest. The committee recommends that members study the planning submission, write their objections (grounds for objecting can be found on the Residents Group website) and send them in either online or by letter. The formal closing date for comments was September 11th, but it is understood that the application will not go to committee until the October meeting, so there is still time to submit comments and have them taken into account. In preparing your objections go through the plans with a question in the back of your mind "What's missing? ", and assume that this building will be constructed as cheaply as possible using the shoddiest materials. The Planning Office appears to have connived at starving the public of information: for instance, residents have already been informed "The LPA is only concerned with the appearance of the external stonework and whether it is constructed in blockwork or panels is not an issue". Of course, it should be an issue in a Conservation Area, and the council's own Conservation Officers should say so. But there is no indication that they have been asked. Meanwhile, the architect has written a rather misleading letter to the Chronicle. Don't be fooled by it. The latest design doesn't address the previous objections, and it remains an oversized caricature of what a building should look like in its Conservation Area location. 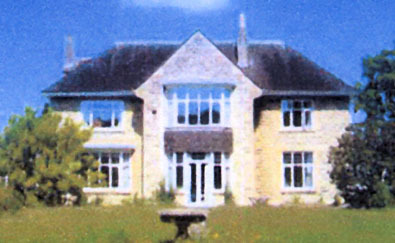 Number 43 Upper Oldfield Park is named Oakford House. It was built in the 1930s in what was previously the grounds of one of the other Victorian properties nearby. It is a perfectly sound building, compatible with the style of the Conservation Area, but of no real architectural merit. In 2006, Conservation Area consent was granted to demolish it, subject to a successful planning application for a replacement building. 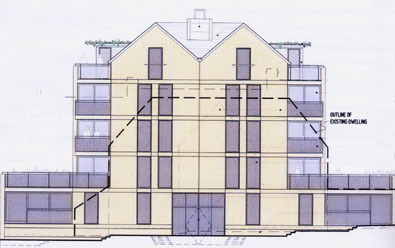 The first planning application for a replacement was for a huge slab-like building, mostly constructed of glass and cement render, containing 14 flats (including a penthouse) above an underground car park. This application was refused on the grounds that it was too big, too obtrusive, and totally out of keeping with the conservation area. The applicant appealed against this decision, but then withdrew the appeal before it went very far. A second planning application was then submitted, this time for 13 flats. This attempt was wider at the base but narrower on the upper floors. There was some reduction in the amount of glazing and much of the cement render was replaced by Bath stone (at least that is what it said in the text, but the drawings still showed cement render). It was also a token 80cm (about 2ft 6in) lower. This application was refused on the grounds that it was incompatible with the style of building in the Conservation Area. The choice of flat roof was particularly criticised. This criticism was accepted, in as much as the third and latest application now has a slate roof and gables. But that raised the height back to the height of the first design! Rather disappointed at the choice of photos the application has used as a photo montage, we have decided to create our own. 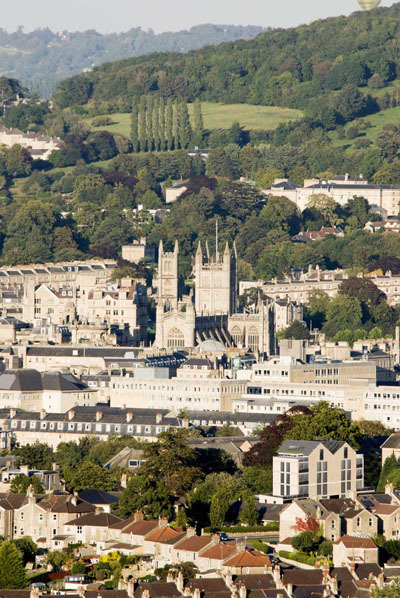 This will give an idea of what the tourists will see if they take a photograph of Bath Abbey from the skyline walk near Twerton Roundhill. It is not an exact picture because it is impossible to get the level of detail that an architect's drawing contains reproduced using a simple photograph editing utility, but care has been taken to get the height and scale correct. This is a realistic rather than perfect image. And the flats stick out like a sore thumb! When the flats are built, we will take this view again and see how close we got to a realistic image. We think it will look very similar.